British eventer Harry Meade continued his remarkable comeback from two shattered elbows by being one of only 35 competitors to make it round the cross country at Badminton on Saturday. 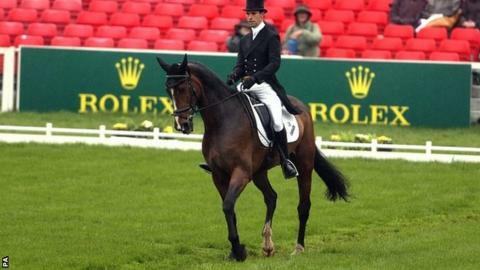 A fall at the Wellington Horse Trials last year left Meade, 30, with career-threatening injuries. But he delivered a clear jumping round with 16.4 time faults to lie eighth. Overnight leader Clark Montgomery failed to finish and Paul Tapner will lead going into Sunday's show jumping. But the focus was on Meade, the son of three-time Olympic gold medallist Richard, following his horrific fall last year. Meade said he was "speared into the ground like a javelin" when he fell aboard Shannondale Santiago in August 2013. A similar fall claimed the life of fellow rider Tom Gadsby the weekend before. Meade's elbow injuries were so serious that one consultant said the shattered bone resembled grains of sand and after undergoing emergency surgery the eventer could not feed or clothe himself. Recalling the fall, Meade said: "I remember it all, 100%. As soon as my hands hit the ground it felt like a trigger detonated explosives strapped to my elbows. "My father thought I was in denial that my career was over. When I said I planned to compete at Badminton, he assumed it was part of a grieving process. "To be back at Badminton was my big target. When someone tells you that your career is over, it makes you look at things in a very different light and when you get a second chance, you don't take things for granted." He had started the day in equal 46th position but ended in eighth after making the most of an early start as the wet and windy conditions and soft ground took their toll, with only 35 out of 81 horses made it round the cross country course. Joining Montgomery, aboard Loughan Glen, in being forced to retire were Mary King, Andrew Nicholson and Francis Whittington, who was lying third after the dressage. William Fox-Pitt, riding Parklane Hawk, fell at the third-last fence. Australian Tapner, riding Kilronan, leads on 56.4 penalty points going into Sunday's showjumping, with Tim Price (Ringwood Sky Boy) of New Zealand second and Frenchman Pascal Leroy, on Minos de Petra, in third place. Oliver Townend, riding Armada, is the leading British rider in fourth while Pippa Funnell (Billy Beware) is sixth.